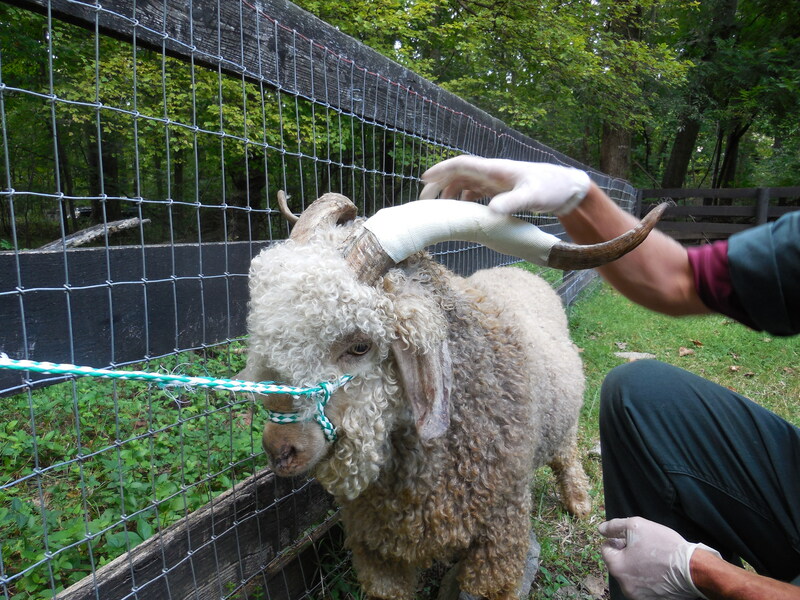 The vet came yesterday to take care of Richie's broken horn. We decided to stabilize the horn rather than take it off because it is too close to breeding season and there is no way to keep Richie from beating his head against all and sundry from now until January. I learned a fair amount about goat horns during this event. The most important thing that I learned was that this break was six inches below where the blood vessel stops, not above it. 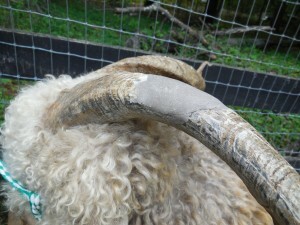 Richie managed to not bust all the way through to the center of his horn - thank goodness - but it was a very close thing. There was the tiniest bit of dried ooze on one side. 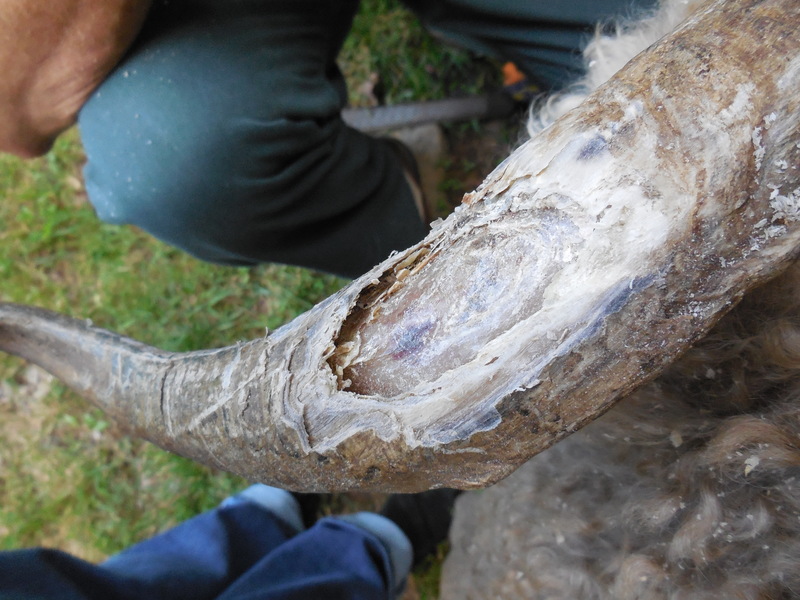 Horns are grown in layers, which means that the horn can peel in layers, and it even can shed off outside rounds like a sheath sliding off of a knife. So the crack had to break through the layers, which is harder to do than if it were one single bone. Think "cutting through a stack of paper" vs. "cutting through a piece of wood." 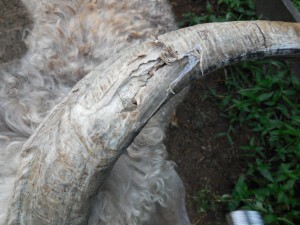 The process for stabilization of a goat horn is straightforward and logical. The vet started by peeling away the separated and broken horn layers. (This was the one part that I would never be confident enough to do!) Then the horn was filled with what the vet called "resin" but which looked a lot like cement. 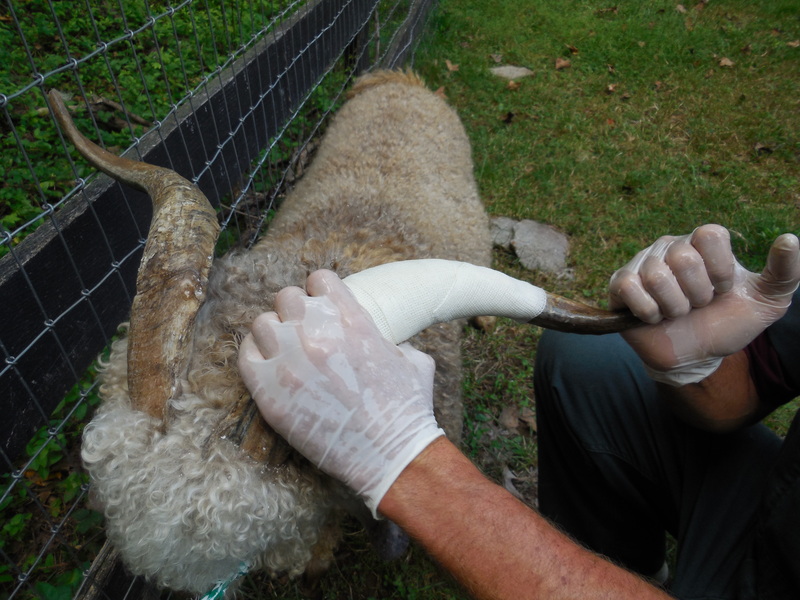 After the cement set, he cleaned the horn with alcohol to be sure the cast would grab the horn and not a layer of crud and took a file to the horn and the cement to rough it up to give the cast a better grip against the various parts of the horn (see comment about sheath, above). He dunked a spool of fiberglass casting material - the same stuff that my doctor used when I broke my arm 30 years ago - in a pail of water and started unrolling at the base of the horn on up past the cement. In five minutes, the fiberglass was set and drying. Ten minutes later, an annoyed Richie was sent off to play with his buddies. The play-by-play photos are behind the cut. He's so badass now, the other goats are going to be jealous. 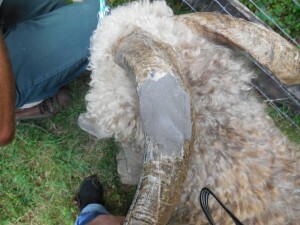 Unfortunately, the way goats "sign" things means that cast is going to be a stinking mess in a few weeks. That's fascinating! Thanks for sharing the process, and I'm glad he's going to be okay. I thought it was pretty interesting. 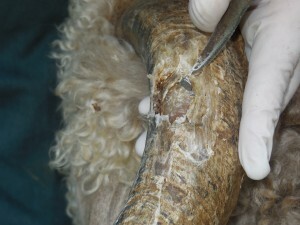 That's why I told the vet I would be taking photos. And you are welcome! I'm glad you liked it. Also, I thought of you, so the photos are all alt-text enabled. The actual photo titles are terrible, but the text descriptions should be solid. That was kind of awesome! I loved the pictures to back up the description! Yeah, I'm kind of a goat-geek that way. I sent copies of the photos to the vet's office. Chances are good that at least one of them is going to end up on the newly updated vet website. Richie's got his 15 minutesweb page hit count of fame coming! That was really neat. Thanks for documenting so we could see! ! I'm glad you enjoyed reading and seeing it. I like sharing interesting learning moments. I wish there were more stuff like this on Dr. Pol and fewer castrations and cow births. One of my reasons for documenting this kind of thing about my goats is so that I can spread the word about my experiences. Years ago, Loki-goat dislocated his toe. I did a write-up about it, complete with copies of the x-ray films, for my goat newsletter. I will do a similar thing for Richie's horn. I don't claim to be the expert on goats, so I don't consider this educational as much as informative. People can be informed of a possibility, and make their own choices with more knowledge in hand.